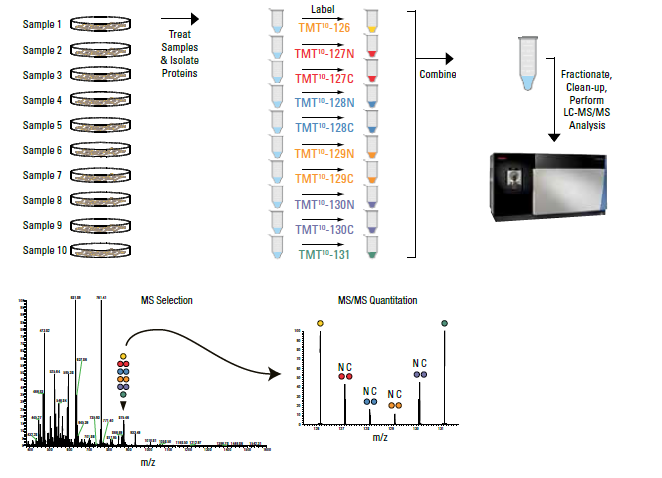 Tandem Mass Tag (TMT) is a powerful technique for comparing protein (and peptide) amounts between six or ten conditions. This technique involves labeling samples after digestion, meaning this technique can be used on in vivo samples, unlike SILAC. Samples to be analyzed by TMT quantitation should be submitted as in-solution samples, in 50 mM triethylammonium bicarbonate and 5% SDS. Analysis of acquired mass-spectrometry data will be performed with Proteome Discoverer 2.2 software. $1500 for TMT 6-plex, $2000 for TMT 10-plex. We run your TMT samples on our Orbitrap Fusion Lumos mass-spectrometry platforms, using an appropriate LC-MS/MS method. We identify and quantify peptides and proteins from samples using Proteome Discoverer 2.2, and send you a spreadsheet including a list of proteins present and the relative amount of each protein in each sample. Contact us before beginning the experiment to discuss experimental design. Ensure all samples have similar amounts of protein. Put each sample into an Eppendorf 1.5ml tube, which has been rinsed with 50% organic solvent and millipure water. Appropriate experimental design and statistical analysis of results are key to a successful quantitative proteomics experiment. You must contact us before beginning your quantitative experiment. Biological and technical repeats are necessary for robust results, so quantitative experiments can be lengthy and expensive. Careful consideration upfront prevents wasted time and money later. If you are planning TMT samples please always contact ProteomicsCore@UTSouthwestern.edu before you prepare and submit your samples.